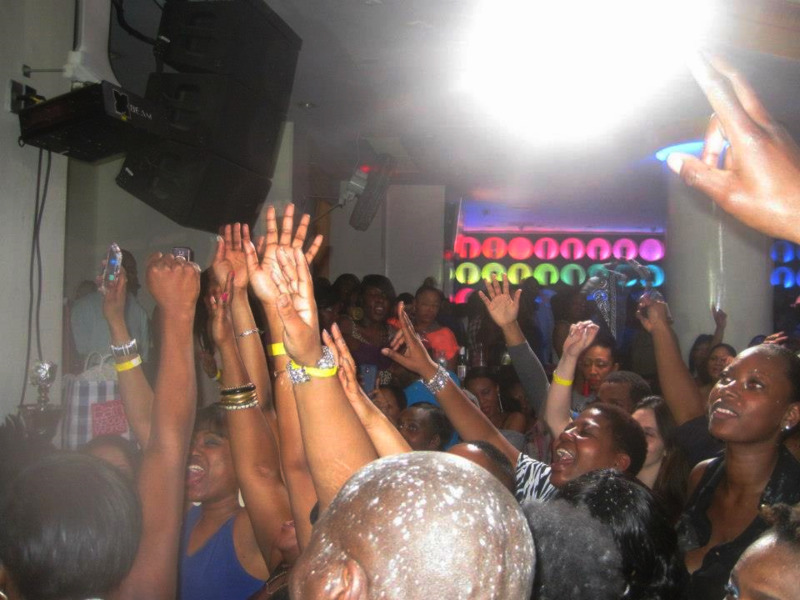 The posh Latin Quarters on 47th Street and Lexington Avenue in Manhattan is not known for hosting powder-flinging soca fetes, but with Bunji Garlin and Fay-Ann Lyons fans suffering from PCD (Post Carnival Depression), that’s what you’re bound to get. This crowd took misbehaving to a whole new level. In fact, I have to shout out the Anti-stush crew from Queens that walked with their water and powder. I was surprised to walk down the steps into the venue at 5:30pm and see that the party was already in full swing: hookah passing, alcohol flowing, and hands waving. Although most people were on the fringes of the club, Back to Basics had people on the dance floor long before the first act took the stage. I have been disappointed before at NYC soca parties where folks are there to see the main acts and rarely show love to those who go on before them. This was not the case at PCD. Mr. Nutron, Yankey Boy, and Lyrikal all received love during their performances. When Yankey Boy pointed the microphone to the crowd they belted out lines from “Rumors” and “Bartender” with enthusiasm. Lyrikal even brought some ladies on stage to take a wine and see if they had on “nothing undah.” Anti-stush indeed. Of course, when The Viking and Viqueen of soca took the stage, the party turned up another notch. At one point, I could barely hear Bunji because the audience was singing “Differentology” so loudly. This may also have been due to mic volume issues also. However, it was Fay-Ann that caused the crowd to lovingly turn on each other, pitting “Anti-Stush” on the right and “Vikings” on the left against each other in the battle for best section. DysChick of course was on the Anti-Stush side, which I think won. I must admit that I enjoyed the first annual Got PCD? event. Big up to Shorblu Events for their professionalism (we had a ticket change issue which they handled beautifully) and keeping the momentum going even after all artists performed. I left with body aches and covered in powder. My PCD was cured. I will be back next year. Announcement: Bunji and Fay-Ann will return to NYC with their entire Asylum band on May 24th. Click here for tickets and location. Subscribe to my YouTube channel for more video from PCD and other soca events.